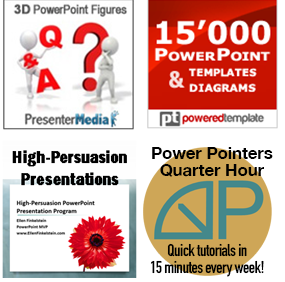 Presenters who use Microsoft PowerPoint 2002 or later have access to several rich animation features – features that, if used intelligently, can add tremendous impact to run-of-the-mill slides. Indeed, with the addition of motion paths, new trigger effects and the ability to add two animation behaviors to one object, PowerPoint has become capable of creating sophisticated animations that rival complex animation software. The following tutorial will show you how to combine motion paths with other animation effects to create vibrant, compelling slides. Most people know about motion-path animation, the feature – available since PowerPoint 2002 – that enables movement of an object along a standard path or one of your own choosing. When motion-path animations are combined with other animation options, such as scaling or rotating, the results can be both wonderful and useful. To illustrate the technique of combining motion paths with other effects, we’ll create an example slide from a driving-class presentation. 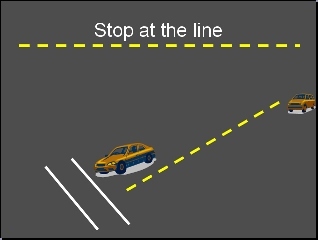 We want the car that looks farthest away to travel toward the audience and stop at the first of two parallel lines. To accomplish this, the object must do two things simultaneously: become larger and move along a path until it stops near the static car in the foreground. 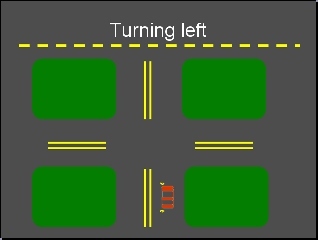 To begin, you need clip art of two vehicles that are close to the same size so they will appear so once the animated car comes to a stop. Then make the one of the car images smaller. Click to select the car, then right-click and choose Format Picture. Once in the Format Picture dialog box, click on the Size tab. This window provides the tools to scale the image by percentage. For my example, I shrunk the car down to 50 percent, making it smaller by half. I then moved the car to the upper-right of the slide. The first animation will increase the size of the car. To make the car larger, choose Slide Show> Custom Animation (PowerPoint 2003), choose Animations tab> Custom Animation (2007) or click the Animations tab and click Animation Pane to open the Custom Animation task pane. In 2003 and 2007, within the task pane, choose Add Effect> Emphasis> Grow/Shrink. In 2010, choose Add Animation from the ribbon, then Emphasis, Grow/Shrink. 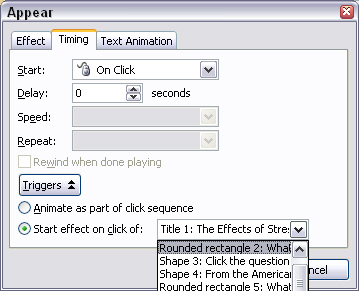 To specify the size needed for the animation, click on the Size drop-down list within the task pane (in 2010, click Effect Options on the ribbon). The options – Tiny, Smaller, Larger and Huge – are vague, so you may prefer to use the Custom text box and enter the percentage you want; click the animation’s down arrow in the task pane and choose Effect Options. Remember, if you initially scale an image down to 50 percent (half its size), you will need the animation effect to scale the smaller image up to 200 percent, to effectively double the image and get it to appear at its original size. You may have to try out a few numbers until you get exactly the right effect. If necessary, you can also adjust the speed of the effect. The default is Medium, but you can use the Speed drop-down list to experiment with different speeds. Now we’ll add the motion-path animation to complete the effect. With the object still selected, return to the Custom Animation task pane and choose Add effect » Motion Paths » Draw Custom Path » Line. In 2010, click Add Animation the ribbon to get the same options. Your cursor is now a crosshair shape, and you can draw the line from the beginning point to the end point. If you want to constrain the line to 15-degree angles, press the Shift key as you draw. 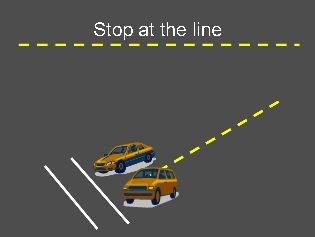 This is a helpful technique to ensure perfectly straight lines. Immediately after you draw the line, the AutoPreview function should show how the car will move along the line. If you need to adjust the line’s beginning or end, select the line and click on the appropriate endpoint. Drag the endpoint to the desired location. At this point in the design, you will likely notice a problem. If you click the Play button within the Custom Animation task pane, you will see both animations running, but they occur one after the other. To make the animations run simultaneously, click on the motion-path animation within the task pane. Click the drop-down arrow appears to the right of the animation name and choose Start With Previous from the subsequent menu. Click Play again (bottom of task pane) and the two animations will occur together. Your car image now moves along the line and gets larger at the same time. As you begin exploring motion paths and other animation effects, it quickly becomes clear there hundreds of combinations are possible that can create some amazing animations. For example, let’s say we wanted to create another driving slide, but one in which the car turns a corner. You can draw a custom motion path using the Curve path type in combination with the Spin emphasis effect. 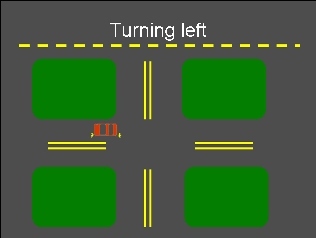 Setting the car object to do a 90-degree turn on the motion-path curve makes it appear to be turning left on the slide. Again, these two animations are blended by giving the Spin emphasis a Start With Previous setting. There are plenty of other possibilities, especially if you explore the More Effects field found in the Entrance, Emphasis and Exit animations. You can change the color of a moving object, make it flicker, even make it become transparent. Trigger effects are a seldom-explored area of animation in PowerPoint, but they can add some impressive multimedia muscle. With trigger effects, you can turn an object on a slide into an action button. As a button, the object triggers an animation effect when you click on it. Usually, a trigger is used when two objects are related in some way. For example, you could place images of a watering can and a flower on a slide. When you click the watering can, the flower grows taller, illustrating the concept that watering the flower makes it grow. To use a trigger effect, begin by creating an animation in the same way you normally would. To add the trigger, select the created animation within the Custom Animation task pane. Click on the drop-down arrow (to the right of the selected animation) and choose Timing from the subsequent menu. The appropriate dialog box for that object’s animation appears. For example, an Appear animation will bring up the Appear dialog box. Click the Triggers button and choose the “Start effect on click of” option. From the drop-down list, select the object you want to act as the trigger and click OK. You will then see a small hand icon next to the animated object to indicate that it has a trigger. To preview the trigger, save your presentation and then go to Slide Show view. 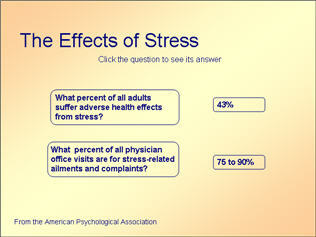 In our example, the answers won’t be visible when the slide first appears onscreen. But place the mouse cursor over a trigger object and the cursor will turn into a hyperlink-type hand. Click the trigger and the answer will appear. Triggers can be lots of fun. They can be used for making quiz answers appear and they are great for presentations designed for children. For example, you can display a question on a slide so that when you click on it, the answer appears beside it on the slide. Again, like motion-path combinations, the possibilities for using triggers are nearly limitless. Whether you want to add a little pizzazz to your presentations, or want more control over the timing of an animation, or if you just want to create a cool quiz, you’ll find that combining animation effects greatly enhances your options. Be creative and experiment with your own ideas. Soon you’ll stumble on all kinds of techniques to add to your portfolio. I’m trying to bring an object into the slide and make it stop where I put it. It keeps returning to the starting point. How do I stop that? On the next slide, another object will join the first one, and stop after entering. I can’t find this anywhere. All I find is the delay option. Wondering if there is a way to have my button change colour when clicked (using the animation “Fill Colour”), and then after say a .50 second delay, move to a slide that was specified in actions?